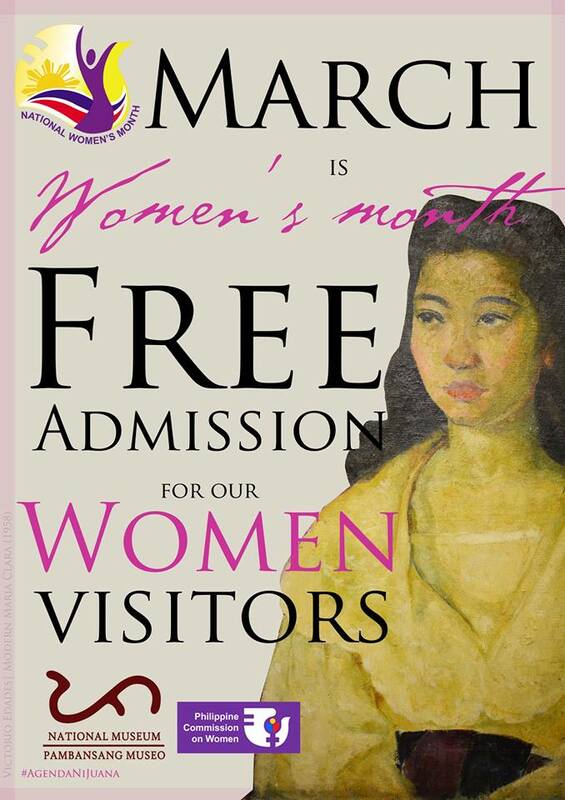 From March 1 to 31, women will have free access to the National Museum located in Manila, Kiangan, Kabayan, Vigan, Angono-Binangonan Petroglyph Site, Tabaco and Butuan. The works of National Artist Benedicto Cabrera’s “Larawan” and “Sabel” series can now be viewed at the National Museum of Fine Arts at the Old Legislative Building in Manila. The museum is open Tuesday to Sunday from 10 am to 5 pm. This entry was posted in Artifacts, Field trip, History, Museum visit, Places to visit, Tourism and tagged Benedicto Cabrera, National Museum of Fine Arts, National Museum of the Philippines, women have free access to the National Museum this month, Women's Month on March 3, 2016 by Yami.